As I mentioned back in my Caesar Salad post, my first cookbook was The New York Times Cookbook, a mighty doorstop-sized tome. I was about 22 when I bought it, and I immediately knew I was in over my head. I could only tackle the simplest of recipes (I believe cucumber salad was my first victory, and even that was a challenge). Mostly I would just refer to it casually in conversation, you know, like, “My New York Times Cookbook says the right figs make all the difference.” I am sure everyone was quite impressed. My second cookbook was a complete 180. Bob Blumer’s The Surreal Gourmet was filled with recipes and language I could easily understand, and it provided me with the Caesar salad recipe I still use to this day. I’m pretty sure I made every single thing in that book. It was my own Julie and Julia (Dawn and Bob), minus the fame and fortune and advanced skill level. We got married in 1993, back when Prodigy was everyone’s internet server of choice. There was no Google, and Food Network was still in its infancy. In other words, cookbooks were still relevant. And boy, did I love them. My cookbook collection grew exponentially each year. I dreamed of a kitchen with a dedicated cookbook shelf to display all of my babies. One day while looking through the Pottery Barn catalog, I saw black ledges hung on a kitchen wall displaying cookbooks, sort of like artwork. 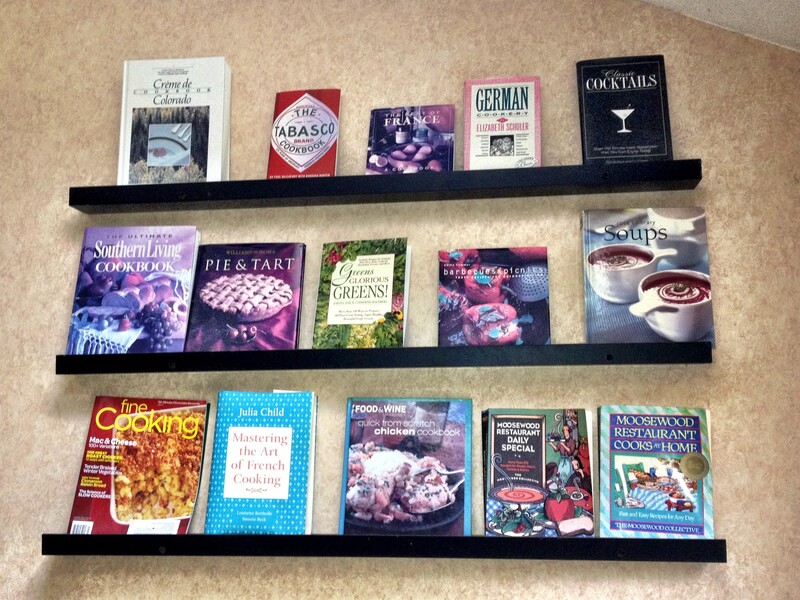 I had a big, blank space on my kitchen wall, and I just knew it was meant to be filled with my cookbooks. The problem was that many of my favorite cookbooks were rather well-loved, Velveteen Rabbit style: ripped, food stained, and generally disgusting. Definitely not artwork. I had a few acceptable, non-disgusting cookbooks, but not enough to fill a wall, so I went online and ordered a vast array of bargain cookbooks based solely on their size, shape and cover art, and these served to fill in the blank spaces. I thought I was quite clever. DO NOT BUY THIS SHELF. I work in contracting and never saw such a poorly made piece of [junk] in my life. This is by far, the worst buy I have ever had from target. The directions are incomplete and inaccurate and the bracket and shelf will never come together, despite your best efforts. Wasted [$$] on two of these things. TARGET PLEASE DISCONTINUE THIS PRODUCT. But thank God I am married to Superman; not only can he build anything, he can also FIX anything. Needless to say, he had his work cut out for him. He was right, he definitely should have just built them from the get-go. Sometimes I’m wrong. I have not purchased a cookbook for several years, thank you, Internet, but I still do appreciate a good cookbook. My cousin Linda recently recommended a fun, quirky, retro book called Square Meals by Jane and Michael Stern, and it’s a must for any cookbook collector. Cousin Linda says the kugel recipe is fabulous, and once I’m done de-carbifying, I plan to try it. The recipes — many of which contain gelatin — are both hilarious and historically accurate. All I know is that Square Meals will be an invaluable reference for me when I host my next Mad Men party. These days, the cookbook has to be pretty special for me to consider it, but I do hope to add to my collection over the years. If there is any “must have” cookbook in your collection, please let me know. There is always room on the shelf for one more. This entry was posted in Life and tagged black ledges, bob blumer, caesar salad recipe, cookbook shelf, new york times cookbook, pottery barn catalog by Mom Mom's Apron. Bookmark the permalink. I love your wall of cookbooks. I see the Colorado one, I have all of those, some are great. You need the ones from Seattle now. Lovely to look at and also filled with yummy things. I will see if I can find you one. What a great idea! The one cookbook I cannot live without has rather a boring cover– the classic _Joy of Cooking_. Several years ago I was reading Jane Vandenburgh’s novel, _Failure To Zigzag_, and I laughed out loud, because a character announced, without explanation, something along the lines of “In this house we do it the way Mrs. Rombauer tells us to.” (Sorry, probably paraphrased.) Yup, we do that in my house, too. I pull that book off the self at least every few weeks. I may not choose to do what Mrs. Rombauer tells us to do, but I like checking! So funny! I would love a nice vintage copy of Joy of Cooking for the old shelf. And I had to check out Failure to Zigzag based on that comment alone — definitely sounds like a book I would enjoy.